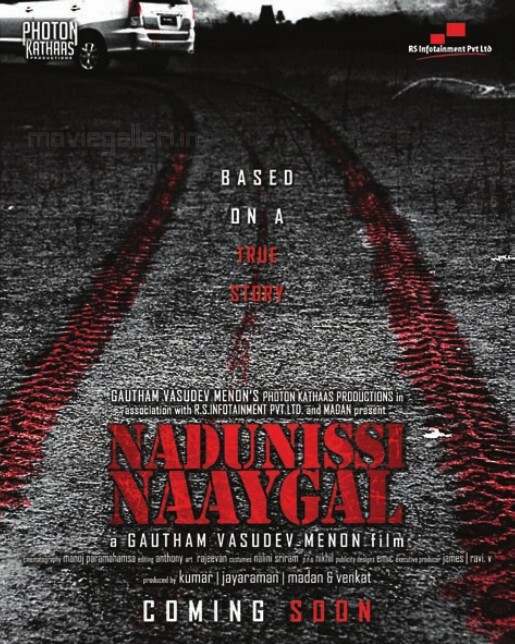 " Obsession - Sexual abuse - MPD "
Nadunisi Naaygal is a Photon Kathaas production from the director Gautham Menon. After success from romantic Vinnaithandi varuvaya, Gautham's attempt in an alternate genre is Nadunissi Naaygal which he tags as a psychological thriller. The movie is about a psychotic man who has a dark childhood. His obsession with a woman, sexual abuse in his past and his multiple personalities lead to the killing of many girls who come across in his life. The whole movie is a flashback narrated by Veera, the lead role in the movie. The first half is about what happens in his childhood and how he is rescued and is given a chance of new life through Meenakshi, a neighbor. Soon, memories of his childhood start haunting veera and he turns violent. He goes hunting for girls, abuses them sexually and eventually kills them. Sameera reddy aka Sukanya is the turning point in Veera's life and brings him to limelight. The story continues to end narrating how Sukanya's life changed because of the kidnap. Technically there are no songs or BGM (that's what Gautham Menon claimed in an interview) in the movie. Many credits to the cameraman who has done a great job with unusual camera angles. Especially scenes within the car and some scenes where the camera acts a character's eye view. Sound engineering is another plus in the movie, but not great. Screenplay is like a sine curve, there are peaks where it moves fast and valleys where it is slow with repeated dialogues. I would say that dialogues are the drawback of this movie. "I love you Meenakshi amma, naan ungala nalla vechu pathukren", makes many from the audience giggle, since it sounds similar to "Chellam, I love you da" - from Prakash Raj. Another aspect that I felt missing in the movie was that the movie rarely was "thrilling", and only few scenes really gave goose bumps. With a storyline like that Gautham Menon could have made a great thriller, if the screenplay had been better. It's a common sentiment that the movie is disturbing. How disturbing, that is left to one's tolerance. There was a moment in the first half when I felt "Can we leave the theatre?". Overall, Watch the movie if you are inquisitive about the movie after watching the trailer. I don't think my wife will ever ask me to go and get popcorn while watching the movie. Never get a lift to home from an old friend. If my wife had used her own suggestion (in this discussion) she would have escaped the trauma and the other girl would have ran away in the middle of the movie. Lora and Jim agreed to play a number game, Lora comes up with a statement that “for any two prime numbers greater than 6 and whose difference is 2, the number between those two prime numbers is always divisible by 6”. How can Jim prove it?